Photo of the northern entrance to Holstein Park by YoChicago1. The stop sign has become obsolete, at least in the place where I’d expect most people want it, in front of a popular neighborhood park bustling with children. No, those who are driving past Holstein Park aren’t stopping on their own, without the presence of a stop sign. The reverse is true: they are not stopping in the presence of a stop sign. The device is no longer used. Watch this video uploaded by “mea2214” of people driving east on Lyndale Street at Oakley Avenue (in the 32nd Ward). Here’s the Street View location. The taxi driven by the man who harassed me and against whom I testified in an administrative hearing. This is the story of my being harassed by a taxi driver while cycling in downtown Chicago the day before Thanksgiving in November 2011. I was riding from Grant Park to meet my mother and sister for lunch at Xoco (449 N Clark). It’s also a set of loose instructions on curbing car culture. The article is divided into three sections: the incident, the hearing, and the results. I am not revealing the taxi driver’s name or cab number: he’s already had his hearing and received due process; additionally, he may not always drive the same cab number. 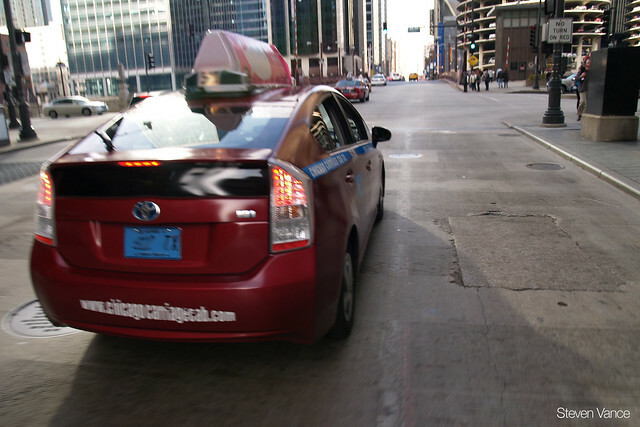 On the day of the incident, November 25, 2011, he leased his cab from the Chicago Carriage Cab Corp. If you feel unsafe from the behaviors of a taxi driver, call 311 immediately after composing yourself and ask to file a complaint against a taxicab driver. You must have the time, location, and taxi number. If your immediate safety is threatened, call 911 first.